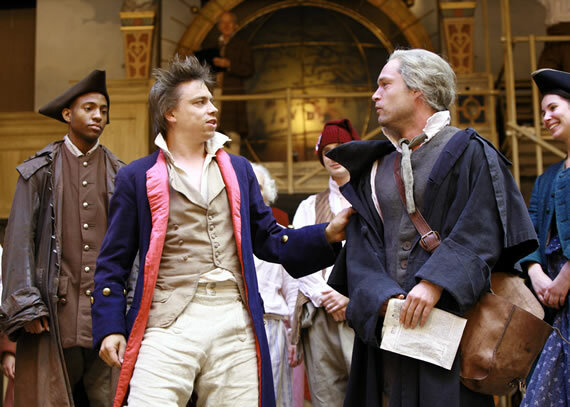 Penny Cole reviews A New World: a life of Thomas Paine by Trevor Griffiths, directed by Dominic Dromgoole, at Shakespeare’s Globe Theatre. With history plays there are two ways to go: you can try to put the whole period on stage – crowds, battles, theory, practice, meetings, arguments, mistakes, successes and the personal lives of the protagonists. Or you can take a smaller snapshot and use it to exemplify and elucidate the whole. You know which route Trevor Griffiths chose when you realise this play is three hours long. This large and engaging production sets out to present on a broad canvas, the personal and political life of Thomas Paine, a key participant in not only the American but also the French revolution. The play marks the 200th anniversary of Paine’s death in 1809. But just as there are areas of space where matter is particularly dense, so revolutions are the areas of history with the greatest density and complexity. The participants face problems none of them have solved in advance. Showing that sense of history unfolding is a major challenge for a writer, and Griffiths manages to incorporate many of Paine’s famous words without putting them in big fat quote marks, showing instead how his ideas developed out of the struggle itself. All national institutions of churches, whether Jewish, Christian or Turkish, appear to me no other than human inventions, set up to terrify and enslave mankind, and monopolise power and profit. Paine was a true internationalist, who held British, American and French citizenship and was condemned by the governments of all three countries at one time or another. He is vigorously played by John Light as an irascible, passionate and irrepressible man. He lives his beliefs, refusing to conform in his personal or political life. The play joins him as he arrives in America, his head bursting with new ideas and a desire to write a roadmap to the future. And what ideas! Just as Milton wrote the arguments for beheading a king, Paine wrote the justification for making revolutionary war against a tyrant country and demanding independence. In his pamphlet Common Sense he told Americans they “had the power to begin the world over again”, and he opens with the resonant words: "Some writers have so confounded society with government, as to leave little or no distinction between them; whereas they are not only different, but have different origins." The play is merrily narrated by Ben Franklin (Keith Bartlett), who has the best jokes and announces he will live on beyond his actual years, for the sole purpose of seeing us through to the end of the play. We see Paine set about drafting the Declaration of Independence, but his version included the right of slaves to be free citizens; the bourgeois revolutionaries of the United States removed that part. It is not surprising that of all the revolutionary generation that included Franklin, Jefferson, Sam Adams, John Adams and the rest, Paine is Barack Obama’s favourite. These are the times that try men's souls: the summer soldier and the sunshine patriot will, in this crisis, shrink from the service of their country; but he that stands it now, deserves the love and thanks of man and woman. Tyranny, like hell, is not easily conquered; yet we have this consolation with us, that the harder the conflict, the more glorious the triumph. What we obtain too cheap, we esteem too lightly: it is dearness only that gives every thing its value. But Paine’s class radicalism and anti-slavery fitted badly with the bourgeois aspirations of the new Republic, and impoverished and excluded from power, he returned to England. There he championed the French Revolution, which was inspired in no small part by what had been achieved in America. In response to Edmund Burke’s furious denunciation in Reflections on the Revolution in France, he responded with his most influential work, The Rights of Man. Human beings, he argued, are born with individual, natural rights, which they agree to “pool” in order to have government. If that government separates itself from the people, alienates those rights, or pretends they do not exist, and subjects the people to its own will and interests, then it is the right and duty of citizens to rise up and remove it, meeting force with force if necessary. On the advice of the artist William Blake, he left Britain for France before publication. He was tried and condemned in his absence for seditious libel, the penalty for which was hanging. It was an offence to own a copy of the book but it still sold 1.5 million copies. Paine joined the most radical wing of the French revolution and was elected a deputy in the National Convention. But he came into fierce conflict with his own side when it came to the decision to execute the king and the leading members of the aristocracy. The play truly comes alive at this point as Paine and Georges Danton – an electrifying performance from James Garnon – debate the difference between revolutionary war and revolutionary terror, and the foundation on which a new society can be built. You might expect a nice English play to come down firmly on the side of Paine, but you can see Danton’s point! Amongst the communards of Paris, Paine meets Carnet de Bonneville, a mate to match his own radicalism, played bewitchingly by Alix Riemer. Following the suppression of the Girondiste (left) wing of the revolution, and after Danton was executed as the Reign of Terror raged out of control, Paine was imprisoned by Robespierre’s government as an alien and perhaps a spy, and left to languish there for a year. The American Consul, Gouverneur Morris, played with devilish enthusiasm by Sean Kearns, was an old antagonist from American times and made no effort to get Paine released. After the intervention of a new consul, Paine returned to America in 1802, aged 65. He ended his life there, poor but unchanged in his beliefs and still writing to the end – “an awkward, stubborn, beautiful soul”. His last work was Agrarian Justice, which denounced private land ownership, stating that it “separates the majority of people from their rightful, natural inheritance, and means of independent survival”. The Globe Theatre is proving that is a great deal more than a tourist attraction, with its powerful productions and exciting performance space. Here, the cast mix with the audience; those in the standing space around the stage are incorporated into the crowds. Music is always a feature, and a number of new songs have been written especially for this play. Would we have understood more if we had been given less? Perhaps, but since revolutions are by their nature tumultuous, Griffiths and director Dominic Dromgoole are entitled to at least try to capture and present that colourful, big picture. Dromgoole has added to the Globe’s Shakespearean role by commissioning a whole series of new historical plays, of which this is the most recent. Thanks to this, the Globe is making a unique contribution to British theatre.